Trew fails to mention the thousands of rocket attacks on Israeli towns since Hamas took control of Gaza in 2007, which resulted in Israel instituting a partial blockade to stem the flow of weaponry to the territory. 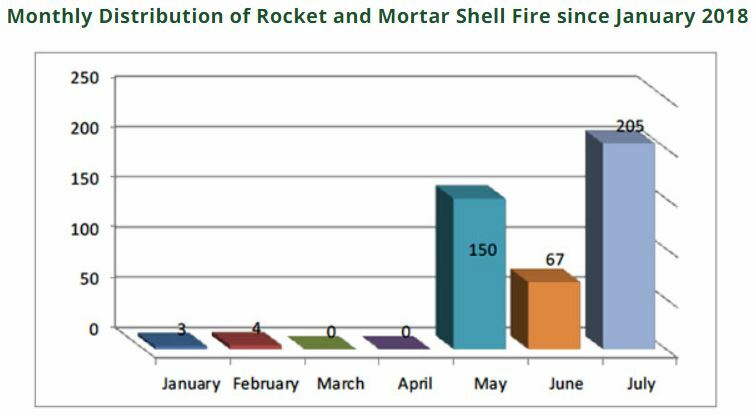 Moreover, since the Great Return March began, hundreds of such rockets and mortars have been fired at Israel by Gaza terrorists – the highest number of rocket attacks since 2014. Tellingly, the word “rocket” doesn’t appear once in the nearly 1,500 word article. Further, Hamas didn’t simply “encourage protesters” to be violent. They embedded their own fighters within the riots and gave instructions to attack civilians if they successfully crossed the border. Actually, the damage caused to Israeli agriculture is closer to two million pounds, not merely “hundreds of thousands”. Here’s footage from July 18th, when a Palestinian kite bomb landed in Kibbutz Erez (close to the border) and set dozens of beehives on fire, killing thousands of bees. First, the Kerem Shalom crossing was never fully closed. Though temporarily closed to commercial goods, it remained open for humanitarian related supplies. Further, by the time the article was published, Kerem Shalom was already partially re-opened for some commercial supplies. Trew also fails to note that Palestinians set the Kerem Shalom crossing on fire three times in recent months, causing tens of millions of pounds of damage. The raid was clearly violent, as the Israeli soldier was killed. It isn’t merely an Israeli ‘claim’. Again, the cause of this exchange of fire was not ‘protests’, but Hamas terror attacks, including rockets and mortars, infiltration attempts and the launching of thousands of incendiary devices. Israel fired on terrorists, and not simply ‘peaceful protesters.’ Hamas acknowledged that 50 of 63 killed on one day were Hamas members. Trew then asks “Who is responsible?”, to which she explains that “both sides blame each other” before adding that “Israel maintains Hamas, that it regards as a terrorist group, has incited violence and endangered the lives of Israelis near the border”. Of course, it isn’t only Israel that regards Hamas as a terror group. The US, European Union and other democratic states do as well. Finally, the “both sides blame each other” phrasing used by the Indy correspondent is one in a long list of clichés employed by journalists to avoid reaching the morally intuitive conclusion that the violent extremist group that controls Gaza is more interested in stoking conflict than the Jewish democracy they’re trying to destroy. “Their goal was to breach the security fence, sneak into Israeli communities and kill civilians”. Their goal was to invade and destroy Israel. “Breach” is too mild a word. Foolish, but that is what it was – and in fact, is continuing each week, to be the goal for these poor deluded fools and their evil leaders making sure they are as far as possible from the action..